The board ran out [Qs][Ts][2s][Kh][6c] and Joseph improved to a set and took the pot. Vogel was eliminated in 10th place and takes home $6,702. You can watch the live stream of the $1,200 Mega Stack Challenge final table by clicking "Watch LIVE Video" at the top of the page. When play resumes, the blinds will be increased to 25,000-50,000 with a 5,000 ante. With 11 players remaining, the average chip stack is now just under 1,490,000. We are down to the final two tables of the $1,200 Mega Stack Challenge Main Event. With 18 players remaining, the average chip stack is now 909,000. The blinds are still 15,000-30,000 with a 5,000 ante. With 19 players remaining, the average chip stack is 861,000. Tournament officials are currently racing off the orange 1,000 chips. 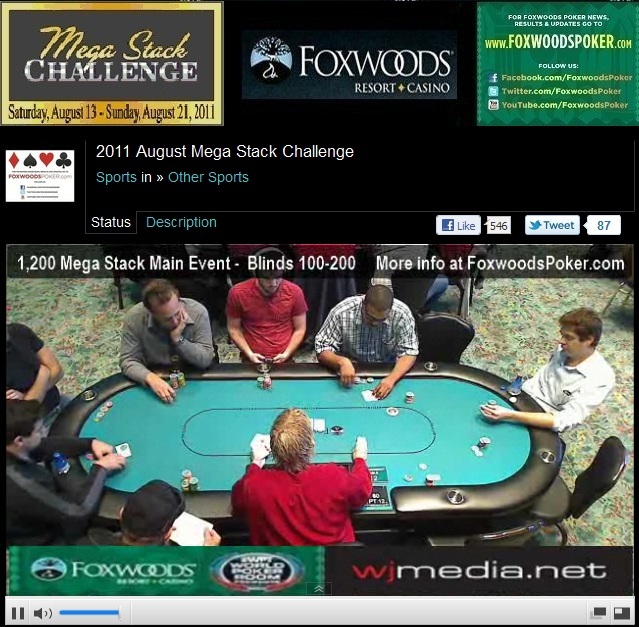 The $1,200 Mega Stack Challenge is now live streaming after the dinner break. There are now 20 players remaining and the average stack is now 818,000. The remaining 20 players are now on a one-hour dinner break. Play will resume at approximately 7pm. Nachman Berlin, who finished second this summer at the World Series of Poker in the $1,500 NLHE event for over $400,000, was just eliminated in 24th place when his pocket tens failed to improve against his opponent's pocket kings. The blinds in the $1,200 Mega Stack Challenge Main Event have been increased to 10,000-20,000 with a 3,000 ante. There are 29 players remaining and the average chip stack is now 564,000. The players in the $1,200 Mega Stack Main Event are now on a 10-minute break. With 38 players remaining, the average chip stack is just over 430,000. 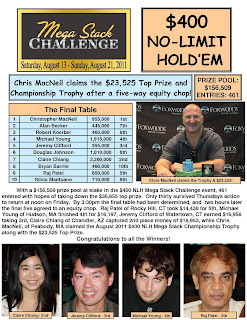 The money bubble hand of the $1,200 August Mega Stack Challenge at the Foxwoods Resort & Casino. The Mega Stack Main Event is in the Money! Just before the break, the bubble has burst in the $1,200 Mega Stack Challenge Main Event. 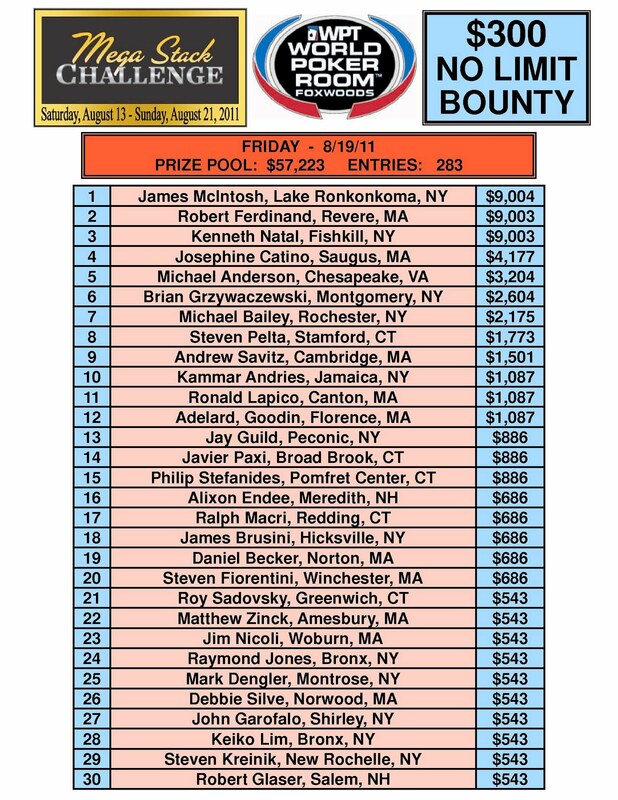 The remaining 45 players are now guaranteed at least $2,681. Matt Kleckner has been eliminated from the $1,200 Mega Stack Main Event just short of the money. With 46 players remaining, play is now hand for hand until one more player is eliminated. On separate tables, both Rob Brown and Dan Colpoys were eliminated from the Mega Stack Main Event just short of the money. With only 52 players remaining, we are quickly approaching the money bubble in the $1,200 Mega Stack Challenge Main Event. The final 45 spots will finish in the money. The blinds have just been increased to 5,000-10,000 with a 1,500 ante. Nick Frangos has been eliminated from the $1,200 Foxwoods Mega Stack Main Event early on Day 2 action. With 61 players remaining, the average chip stack is now just over 268,000. The top 45 spots will finish in the money. With 86 players still in the tournament and play scheduled to go down to a winner today, players are preparing for what is sure to be a very long day of poker. With 69 players remaining, the average chip stack is now just over 237,000. 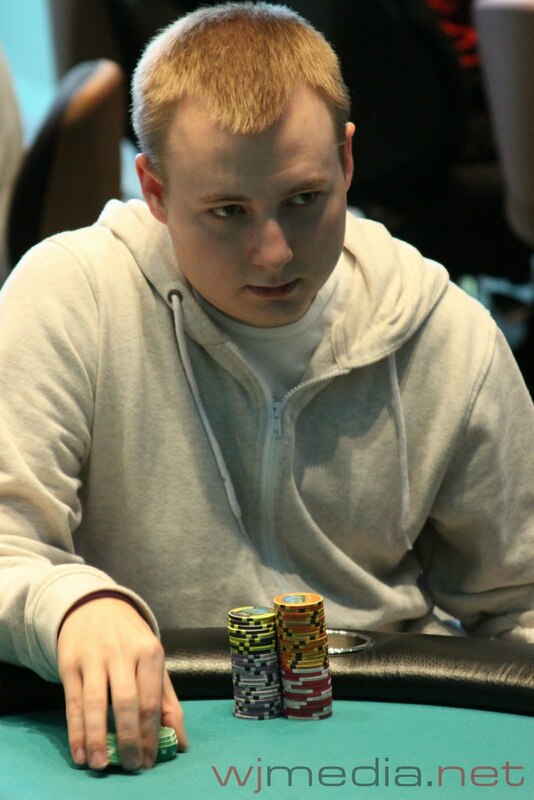 At the start of Day 2 action, Ken Harding enters play as the chip leader with 510,000. Cards are back in the air on Day 2 of the $1,200 Mega Stack Main Event. The blinds are now 2,500-5,000 with a 500 ante. With 86 players remaining, the average chip stack is just over 190,000. Play has ended on Day 1 of the $1,200 Mega Stack Challenge Main Event. 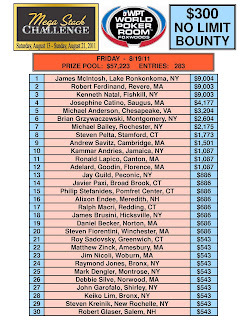 There look to be 88 players remaining and the average chip stack is just under 186,000. Day 2 of the Main Event will resume tomorrow at 11am. 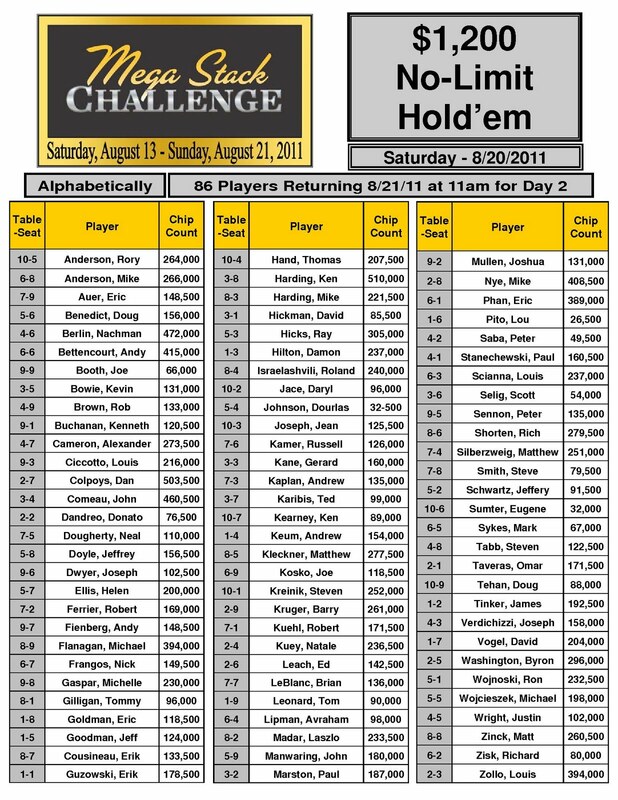 End of day chip counts and Day 2 seat assignments will be posted here on FoxwoodsPoker.com as soon as they are available. Ari Engel has been eliminated from the $1,200 Mega Stack Main Event late on Day 1 action. Ronnie Bardah was just eliminated from the Mega Stack Main Event after his pair of jacks were run down by his opponent's 8-6 off suit. Matt Kleckner has steadily been accumulating chips all day and now sits on nearly 275,000 late on Day 1 of the Mega Stack Main Event. With 112 players remaining, the average chip stack is now 146,000. There will be one more level of play on Day 1 action. The blinds in the $1,200 Mega Stack Main Event have been increased to 1,500-3,000 with a 400 ante. With 125 players remaining, the average chip stack is now 130,900. With 162 players remaining, the average chip stack is now just under 101,000. Actor/Director James Woods had been battling with a short stack since dinner break and was eliminated from the Main Event just moments ago. James "jcamby" Campbell has been eliminated from the Mega Stack Main Event late on Day 1 action. Nachman Berlin, who finished second this summer at the World Series of Poker in the $1,500 NLHE event for over $400,000, looks to be near the chip lead on Day 1 of the $1,200 Mega Stack Challenge Main Event. With the chip average at just over 82,000, Berlin now sits on nearly 250,000 in chips. After winning a nice pot just before dinner break with pocket kings, Ronnie Bardah has continued to chip up on Day 1 of the $1,200 Mega Stack Main Event and now has 155,000 in chips. Play has resumed after the dinner break in the $1,200 Mega Stack Challenge. There are 232 players remaining and the average chip stack is now 70,500. The blinds will remain at 600-1,200 with a 200 ante for another 25 minutes. 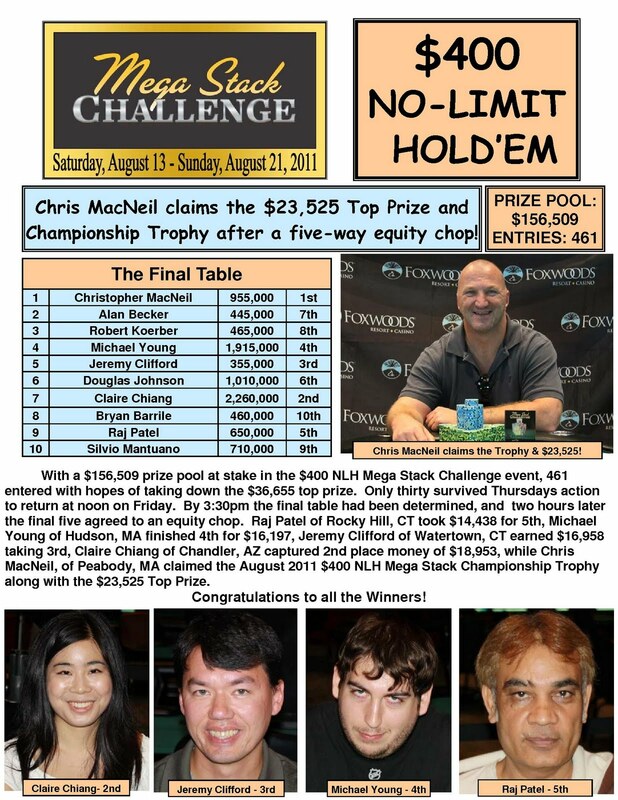 The players in the $1,200 Mega Stack Challenge are now on a one-hour and 15 minute dinner break. 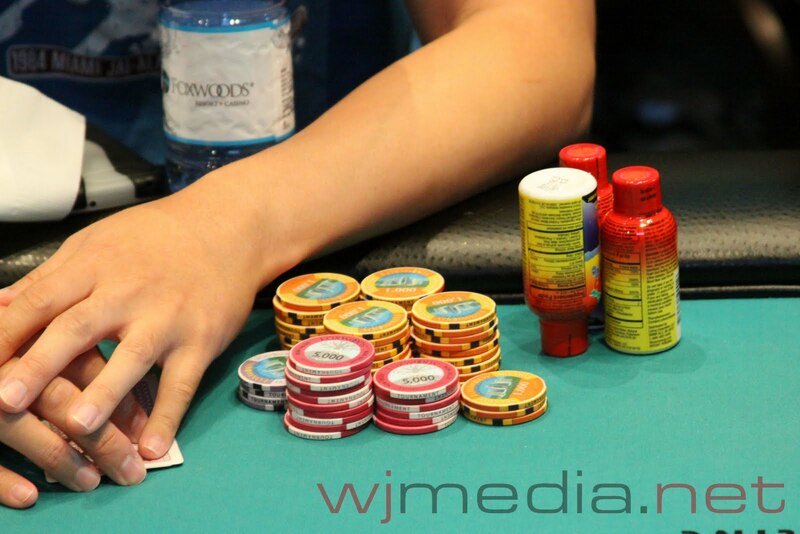 There are approximately 232 players remaining and the average chip stack is now 70,500. The blinds will remain at 600-1,200 with a 200 ante for another 25 minutes when play resumes. 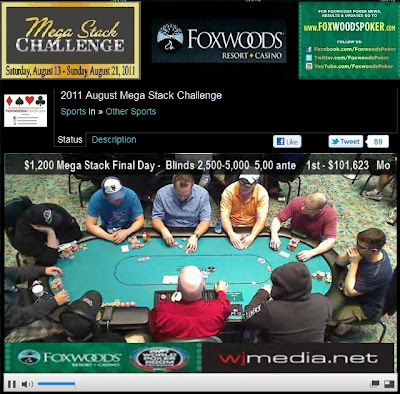 The players in the $1,200 Mega Stack Challenge Main Event are now on a 15-minute break. Tournament officials are now coloring up the green 25 chips. With 286 players remaining, the average chip stack is now 57,200. We are now down to 300 players in the $1,200 Mega Stack Main Event. The blinds are currently 400-800 with a 75 and the average chip stack is now 54,500. Players will be going on a one-hour and 15 minute dinner break at 6:30pm. With 330 players remaining, the average chip stack is now 49,575. 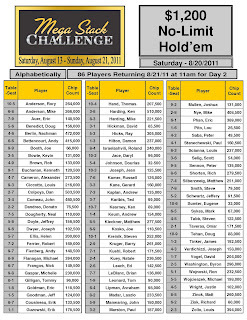 We had a total of 409 players in the $1,200 NLHE Mega Stack Challenge event. Early in Level 6 on Day 1 of the $1,200 Mega Stack Challenge Main Event, Dan Colpoys looks to have jumped out to an early chip lead. At the moment, he is sitting on just about 150,000. Two of the best online and live players in the world, Ari Engel and James Campbell, find themselves seated next to each other on Day 1 of the $1,200 Mega Stack Challenge Main Event. 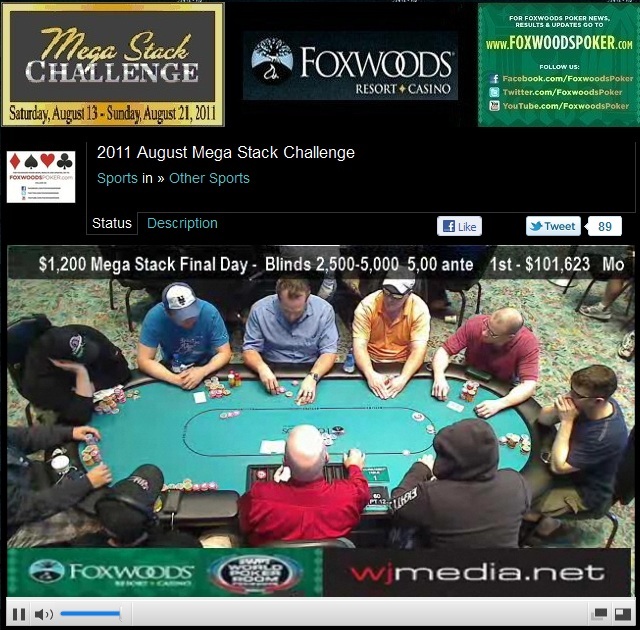 Foxwoods looks to be a quick stop on their trek to Canada to get back to the online poker grind. There board currently reads 409 players in today's event. James Woods, Ronnie Bardah, James Cambell, Ari Engel, Nick Frangos, Andrew Touchette, Kevin Calenzo, Matt Kleckner, Nachman Berlin, Pat White, Rob Brown, Peter Campo, Matt Wantman, Eric Siegel, Steve Happas, Luis Vazquez, Vinny Maglio, Raj Patel, Bobby Ferdinand, Brian Lee and Dan Suied. There are currently 404 players registered. Yesterday was Rob Brown's birthday but today he is playing the $1,200 Mega Stack Main Event. He got an late present when he more than doubled up in the very first level of the day. After a raise before the flop to 450 and a call from another player, Brown called from the big blind. The flop came down 8-8-3 and the Brown checked. The original raiser fired 1,050 and the caller made it 2,500. Brown four-bet to 5,350 and the original raiser folded. The second player announced all-in for his 40,000 stack and Brown immediately made the call, stating "You have aces, don't you?" The player did indeed have aces but had been out flopped by Brown's [Td][8d]. Brown's hand held up to boost his stack to over 90,000 early in the Main Event. $1,200 Main Event Now Live Streaming! 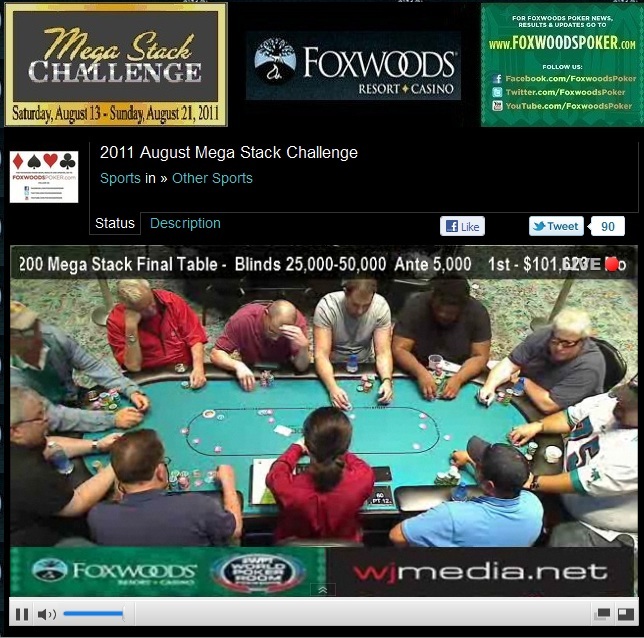 The feature table of the $1,200 Foxwoods Mega Stack Challenge Main Event is now streaming live. Just click "Watch LIVE Video" at the top of the page to view the live feed all tournament long! The blinds have been increased to 100-200. There are now 390 players in today's event with registration open through the completion of this level. The blinds in the $1,200 Mega Stack Challenge Main Event have been increased to 75-150. There are now over 350 players registered in today's event. With play just underway, we already have over 300 players registered for today's Main Event. Registration will remain open for through the first three levels of the event. 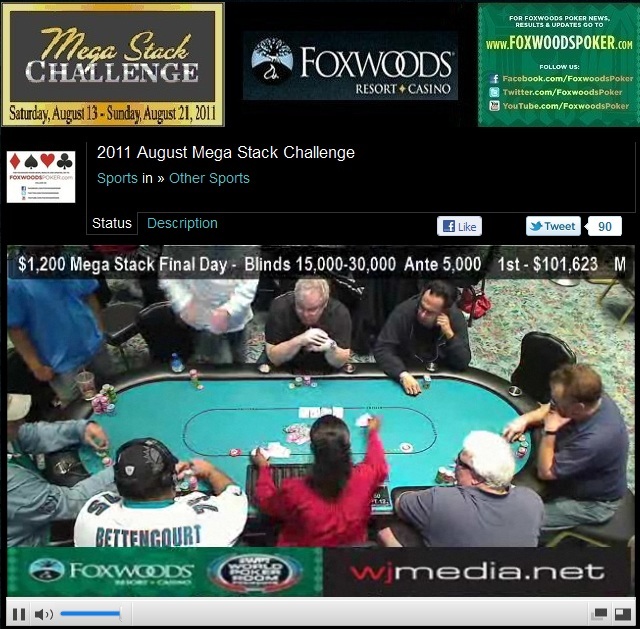 Cards are in the air at the $1,200 Mega Stack Challenge Main Event. This event has a $200,000 guaranteed prize pool. Players start with 40,000 in chips and the blinds are starting at 50-100. Levels 1-12 are 40 minutes in length, Levels 13 and up will be 50 minutes in length and blind levels at the final table will be 60 minutes.